Before I share this week’s pick with you, I should note that it’s the third episode in a five-part series. If you haven’t listened to the first two, be sure to check those out here and here when you get the chance. With that, this week’s Rewind episode is brought to you by Brian Clark and Jerod Morris on The Digital Entrepreneur. On their latest show, they discuss the “access” approach to modern marketing and what drives a successful website. The modern marketing website offers more than static information, more than useful content — it offers an experience. Access is what the experience is all about. In this 25-minute episode, Brian and Jerod go over how access gives you the opportunity for true communities and why you no longer need an enterprise-level war chest. On this episode of Technology Translated, Damany Daniel joins host Scott Ellis to discuss the relationship between technology and events, plus the tools you need to put on a good show. 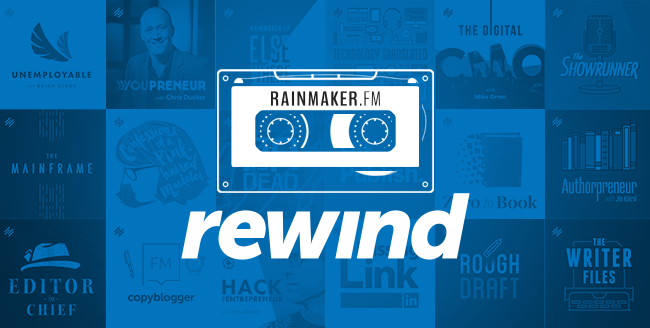 If you want to get my Rainmaker Rewind pick of the week sent straight to your favorite podcast player, subscribe right here on Rainmaker.FM. Caroline Early is the Associate Producer of Rainmaker FM. You can occasionally find her on Unemployable with Brian Clark or follow her on Twitter. To be honest, I have only been in the online marketing for 2 years and i’ve experienced quite a handful of different events where it lead to hardmanship. Ofcourse if you start with the right part you will never end up in the wrong location. For me though, Google was like the best online marketing partner to be with. otherwise this will lead to a wrong location and disappointment. It’s never easy to gain a quick advantage in online marketing sector. This needs time, all we need to focus is on the right part and continue towards our goal. Thank your very much for the quick rewind. Great Content. I’ve been working on my Productivity book and it’s inspiring to read such writings regarding with access approach in online marketing. Thank you.